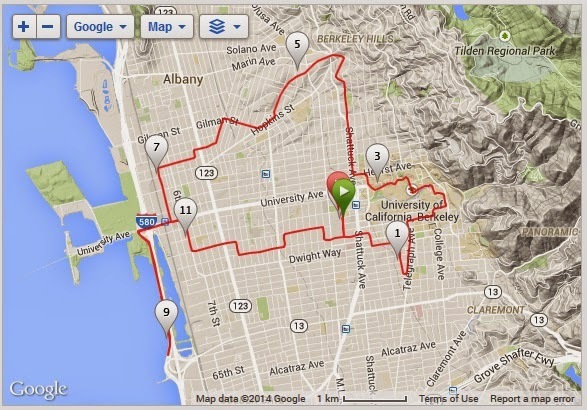 DirtyTrailShoes : Scott Noack's Running Blog: Race Report : Berkeley Half Marathon : 2nd year New Course! Race Report : Berkeley Half Marathon : 2nd year New Course! course didn't take in enough Berkeley high-lights: no Bears, no college spirit, no blue and gold! I though the race was fine and really enjoyed the beer garden at the finish - then again I normally do. To the Race Director (RD) credit they listened and we had an even better course this year. Like last year I bought a parking ticket online at GoPark and parked at same parking garage near the start as last year. We had roughly 5000 runners in 2013 and I was expecting more this year after the course change so I arrived ridiculously early (6:30AM). The HM started at 8AM (actually wave 3 at 8:10AM). I knew going in that I was not going to PR and not run faster than last years 1:54 cuz I just finished the Morgan Hill Marathon the prior week and wanted to concentrate on supporting Michelle's very first half marathon (more on that later). Attire for this years race - no I only used two not four Hammer Gels. I had plenty of parking places to choose from so parked on second floor, had my pick of about 50 porta-potties, then did other chores like pick up my tech shirts cuz I elected for bib mail then my drop bag at the high school gym. Still at 7AM there were only a handful of people milling around. At the gym I ran into two Kaiser Permanente colleagues (Senthil and Derrek) and the incredible Sam Louie! The one and only Sam Louie volunteering as his foot heals. At 7:00AM as pictured below you wouldn't know a race was going to start in an hour it was soo quiet. By 7:45AM we entered Wave 3 corral and it was getting crowded. Final shot minutes before we started out. There were four in our party including myself, Michelle, Duo and Yan. All three were running their first half marathon that morning and you could feel the excitement. Michelle and Yan grew up together, actually attended the same elementary school and hadn't seen each other for ~30 years. And, both were runners. Both specialized more in the shorter distances and weren't sure what pace to set for a half marathon. We eventually decided on the 2 hour pace group; although Michelle said she'd like to finish in 2:30 (Yan sub two). We started out together and paced ahead of the 2 hr pacer at about 8:30 min/mile. I felt pretty good after last weekend's marathon but new I couldn't/shouldn't go faster. At about mile 4 Michelle dropped us like a bad cold and sped up. That was also after about the last little hill. One neat artifact of the course is that at about mile 8 you reach a two way stretch were you see the faster runners coming back at you. When I entered this area I saw was the 1:35 group exiting. Eventually I saw Michelle ahead of the 1:55, with Yan a couple minutes behind. At the turn around I ran into Duo and after saying 'Hi' she sped off. Michelle ended up passing the 1:55 group and finished with a 1:51 (Yan with 1:55, Duo with 2:04 and me with 2:07). From a bling point of view, the medals were nice and if you finished the San Francisco Marathon you received a 'challenge' medal. The course was an interesting mix of areas. Morning temperature was a cool ~50 and maybe it warmed up to ~68 by 10AM. Was a great day for a race and the new course was much better than last years. My Garmin 310xt reported an elevation gain of 485 ft. I remember two hills and an over pass.